Almost every Friday night, you’ll find an oven blazing with a round baking stone heating up inside. Homemade pizzas were made weekly when I was growing up and we’ve continued the tradition. 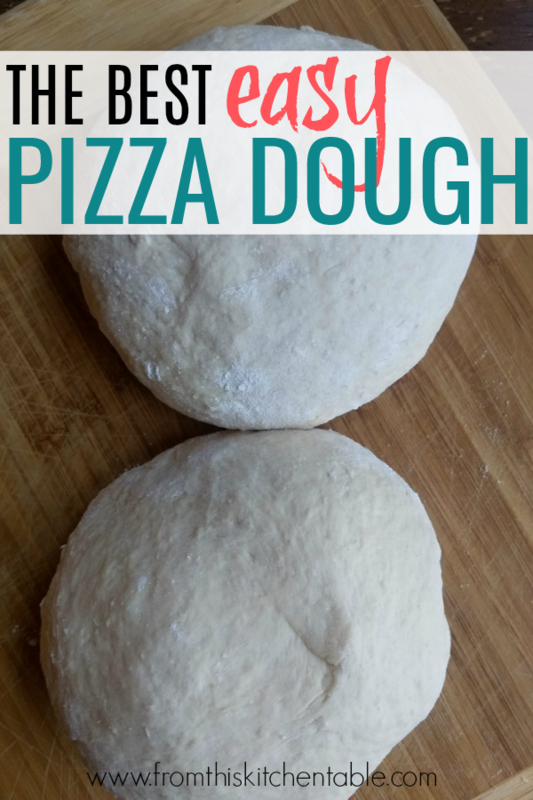 Try this basic pizza dough recipe and join in the tradition! 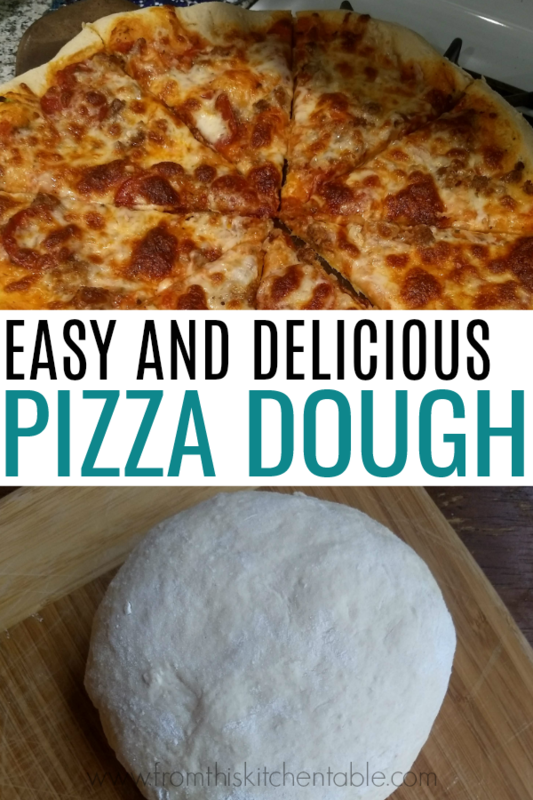 Last week I shared some ways to make homemade pizza frugally so that even if you are on a budget you’ll still be able to enjoy pizza night and my sauce recipe is here. Today I have my basic pizza crust recipe and baking instructions for you! My number one tip for a successful homemade pizza: A baking stone ! We have a 15 inch round stone from Pampered Chef. It has become well seasoned over the years and is well worth the investment. My second tip: Don’t roll all of the air bubbles out of the dough. I use a combination of stretching, tossing, and rolling. I like to use my mini pizza and pastry roller (one similar to this). My third tip: Preheat the oven and the stone. Give it longer than when your oven says it’s ready. You want the stone good and hot. My fourth tip: Use a high temperature. I turn the oven to 475 degrees. I know crust thickness is somewhat a personal preference. This crust recipe fits a 15 inch stone. in a hand tossed/New York Style type of thickness. If you like super thin and crispy, cut the flour back. If you like your crust thicker, increase it to 2 3/4-3 cups. Don’t forget, this means the water amounts will change as well. 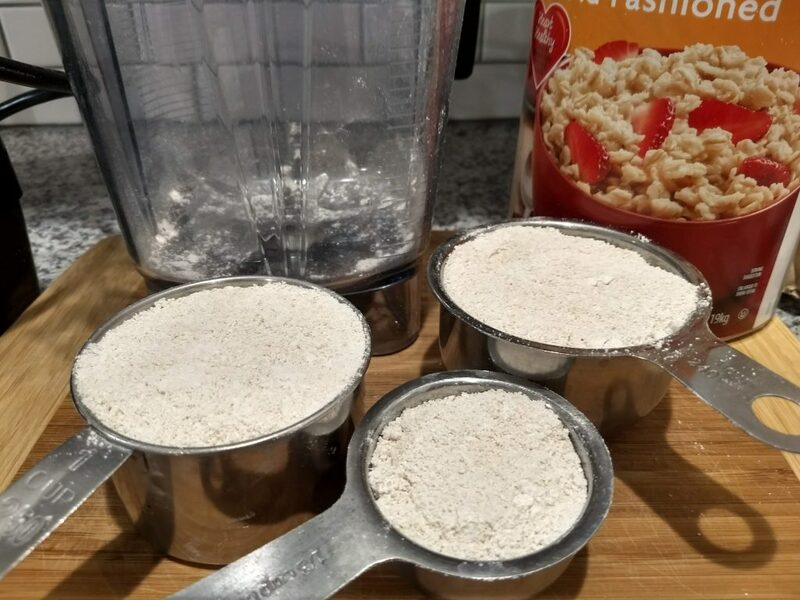 Gradually add the water to the flour until you come up with the right dough consistency. The first time you make this, it will be a little bit of a guessing game. Simply tweak it the next time to your family’s preference. 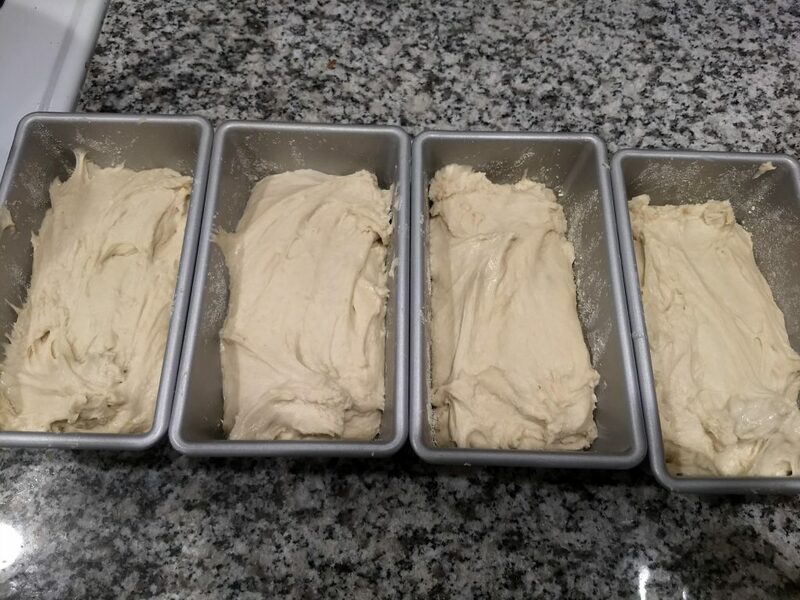 I prefer to let this dough rise for several hours but when I’ve been in a rush I’ve made and used it after a short 15-30 minute resting period and it was still good. We’ve also used part whole wheat flour and all whole wheat flour. This will change the texture slightly and you’ll end up using more water. 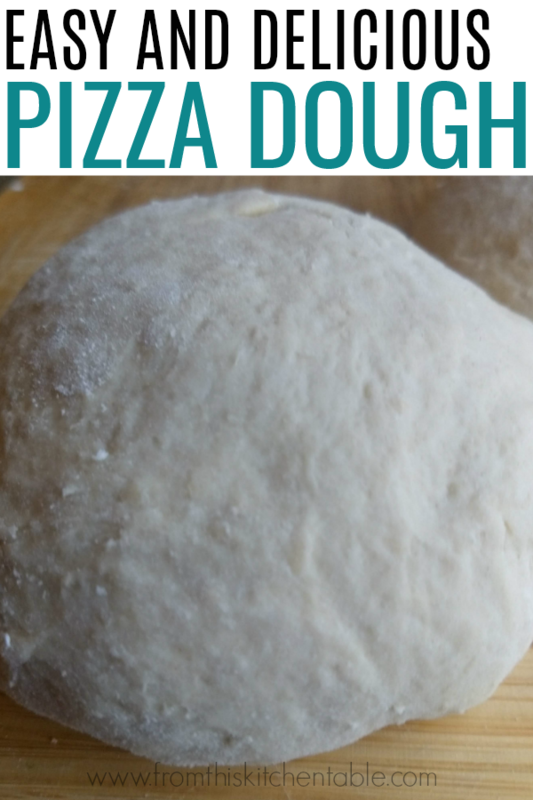 Now that we are a family of 5, I always double this basic pizza dough recipe. 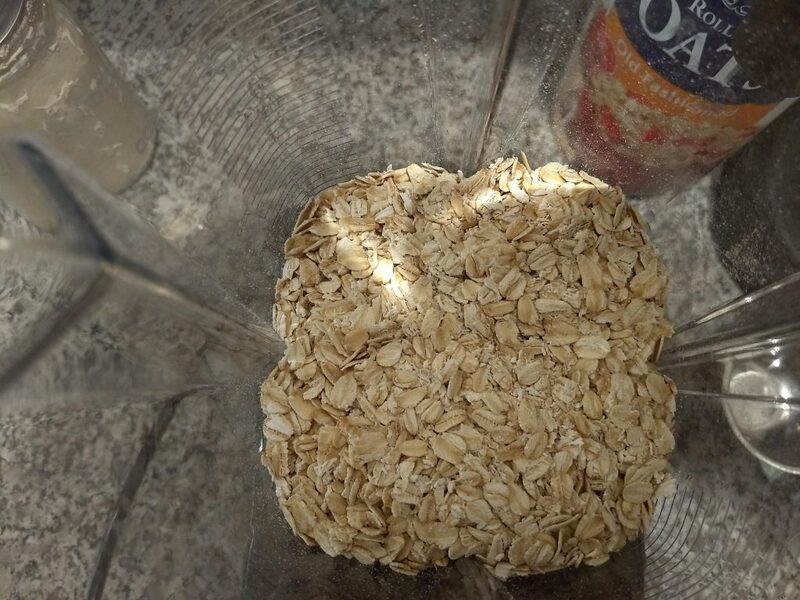 Use a full tablespoon of yeast in a double recipe. Place flour in mixer bowl. Top with salt, sugar, and yeast. Add water and oil. Should make a soft dough that isn't sticky at all. Knead until dough is smooth and elastic. Cover mixing bowl and let dough rise until at least doubled - a couple of hours. It's okay if it goes longer. Thirty to sixty minutes before you are going to bake your pizza, preheat the oven and stone to 475 degrees. Gently put the dough on a lightly floured surface. Next roll, stretch, and toss your dough into a 15 inch circle. When rolling, do it gently so not to deflate all of the air bubbles. I prefer to use my mini roller. Remove the stone from the oven and carefully carry and place the crust onto it. Spread with sauce of choice. 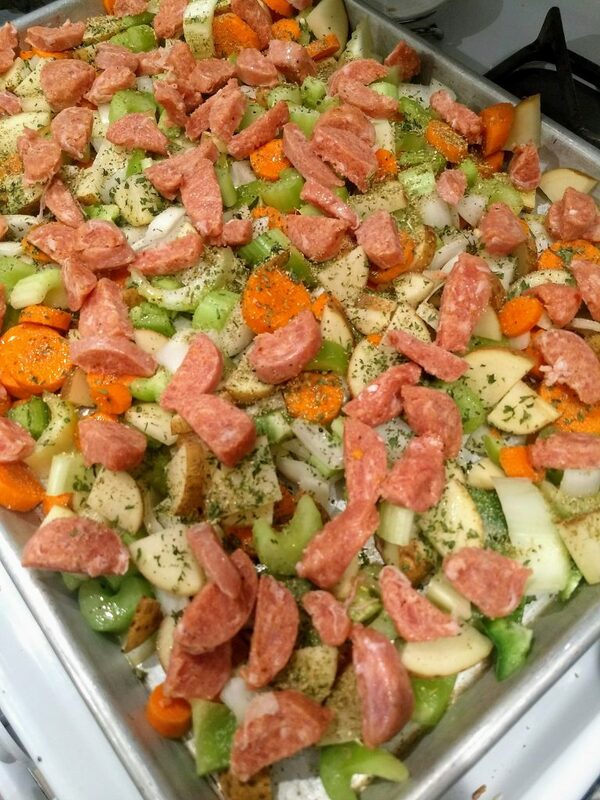 Top with meats, vegetables, and cheese. 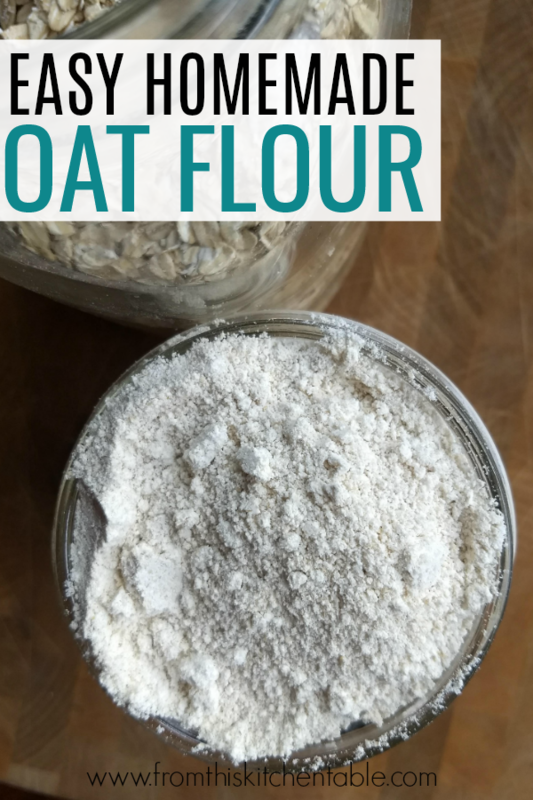 I always double this recipe and simply use a full tablespoon of yeast. 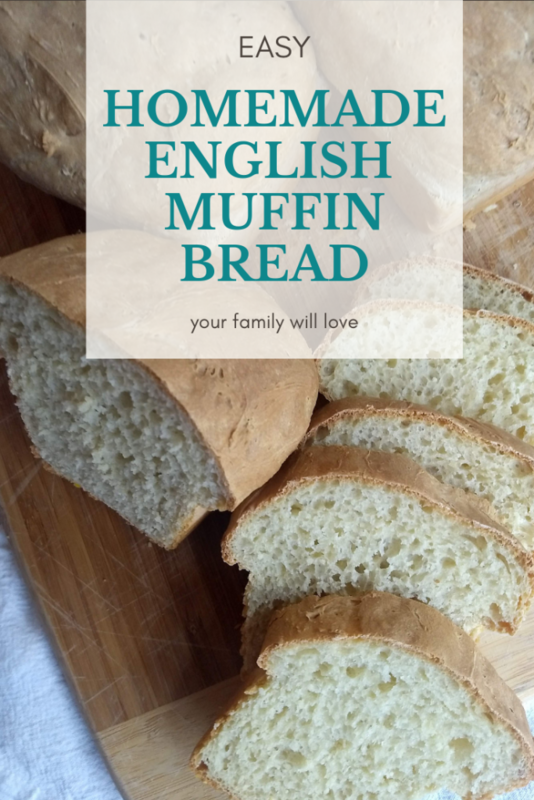 This entry was posted in Bread and Muffins, Main Dish on January 4, 2019 by Deanna Michaels. Have you jumped on the sheet pan dinner band wagon? They are so easy and customize-able. 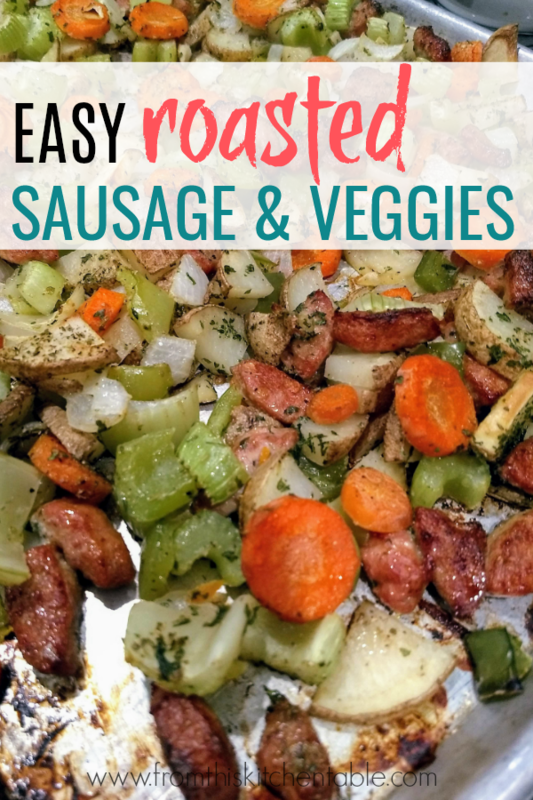 This sheet pan roasted sausage and veggies recipe is no different. 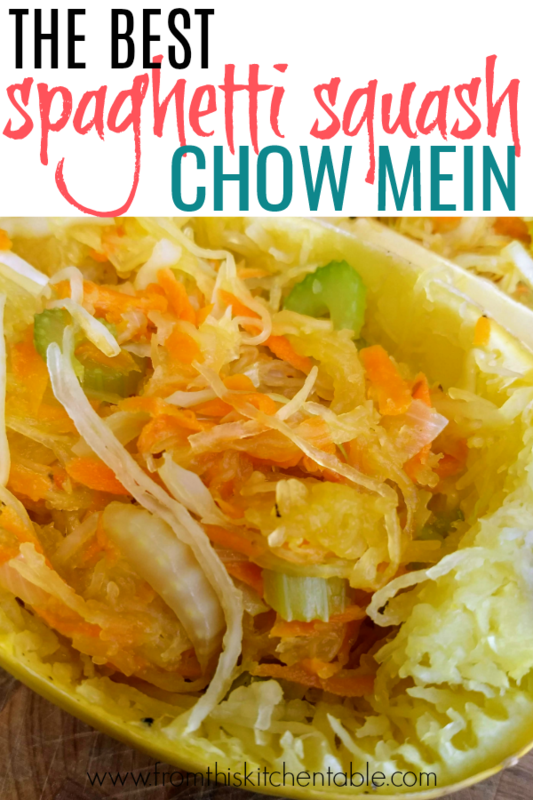 This recipe is a go to in the fall and winter months. (Actually, even spring. The only time I don’t make this is in the summer when it’s blazing hot.) It’s a simple meal to add to the menu for one of those days when life is crazy and you don’t really want to think about what’s for dinner. It’s easy to switch up the ingredients based on personal preference, what you have on hand, and what’s on sale. See, I told you it’s amazing! Italian Sausage: pork, turkey, spicy, mild – your choice. Amount is also up to you, but somewhere between 12-20 ounces or between half of a link to a whole link of sausage. Veggies: 8 cups of vegetables. 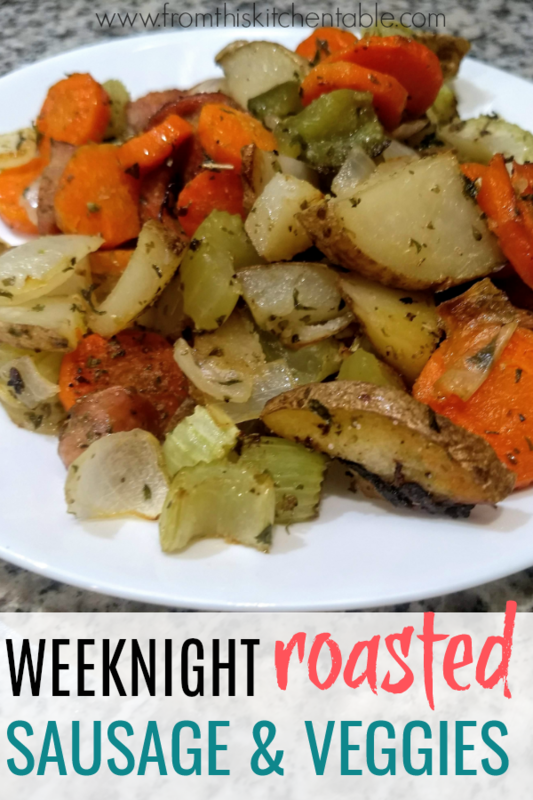 Celery, carrots, onion, bell peppers, potatoes, sweet potatoes, broccoli, green beans, corn or any other roasting friendly vegetables. How to Serve: You can serve up just plates of roasted veggies and sausage (my preference) or put over something like rice, potatoes, zucchini noodles or whatever you like. Another super easy supper, is this Alfredo or these baked chicken thighs. 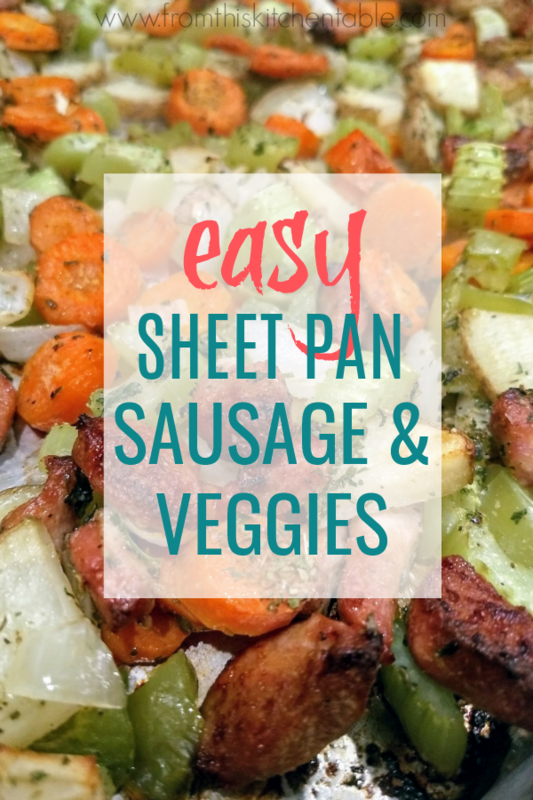 Prepare all of the veggies and place on a large sheet pan (or two smaller ones). Drizzle with olive oil and toss together. Sprinkle evenly with parsley, oregano, garlic, salt, and pepper. Slice the sausage (see notes) and spread over the veggies. Bake for 20 minutes. Remove from oven and stir. Bake another 20 minutes. Serve by itself or with side of choice. 1. Sausage: I prefer slicing my sausage when it's partially frozen. You can either slice in circles or cut in half lengthwise and then slice. That is what I do, because I feed kids and don't want to worry about it being a choking hazard. You could also leave the sausages whole. 2. Servings size depends on if you serve with rice or by itself. This entry was posted in Food, Main Dish, Recipes on November 16, 2018 by Deanna Michaels. 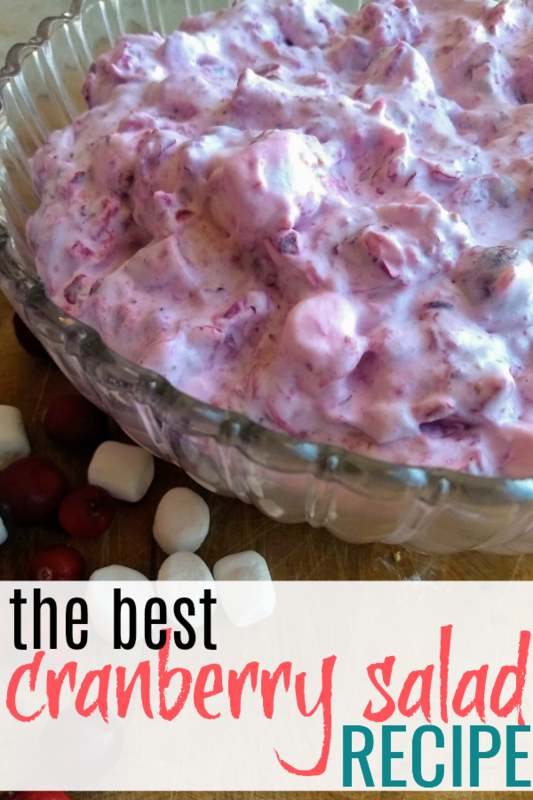 When I think Thanksgiving this best creamy cranberry salad recipe is one of the first things that comes to mind. In fact, my family loves it so much it also makes an appearance at our Christmas Eve dinner. I like to stock up on cranberry discounts after Thanksgiving is over and store several bags in the freezer to last through the year. They are perfect for this salad, muffins, and any other fresh cranberry recipes. This particular recipe came from my grandma. It was one of the ones that my continued to make and now so do my siblings and I. Recipes that hold special memories are the best kind. 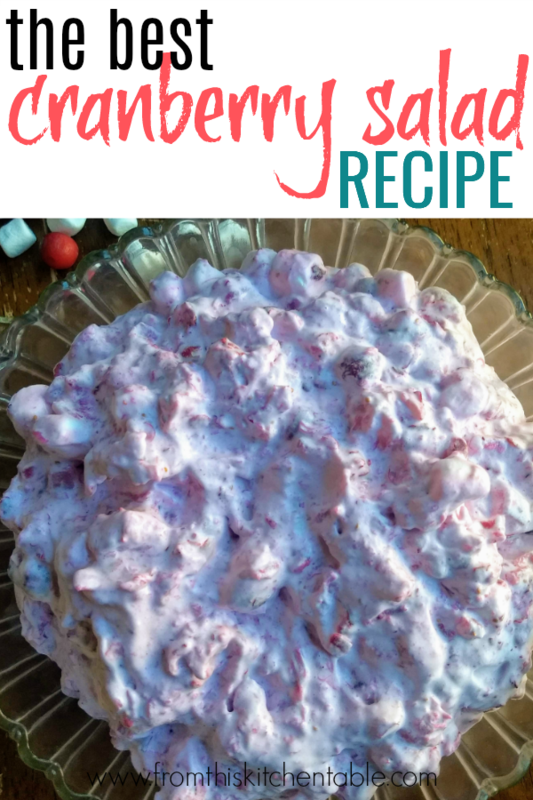 Add this cranberry salad recipe to your Thanksgiving or Christmas dinner (or really, just meal) and it will be the dish you are always asked to make. Ground cranberries and sugar mixed together. What are the other components of this dish besides good old cranberries? That’s it! See how easy it is? You can also make this dish the day before. The marshmallows absorb any liquid and turn into this delightfully light and airy bite. Cooking for a crowd, be sure and double this recipe! Besides, you will want leftovers too. Let’s talk sugar for a minute. When I made this cranberry salad recipe for these pictures, I used just 1/3 cup of sugar and a sprinkle of stevia. It’s a little tart, but still good! Disclaimer: I would not recommend starting with that small of amount of sugar your first time making it! 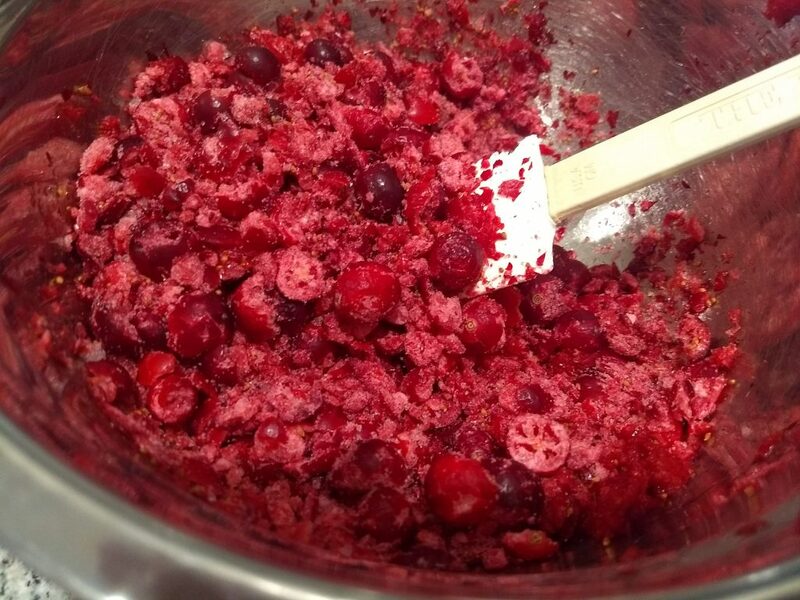 Using a food processor or blender, grind the bag of cranberries. Pulse button works well. I like them to to be ground but with some large pieces mixed in. Drain the can of crushed pineapple very well. It yields approximately 1⅓ cups after drained. Add the drained pineapple and sugar to the cranberries and mix well. Stir in the marshmallows. Whip the heavy cream until medium to stiff peaks form. Fold whipped cream into the cranberry mixture. 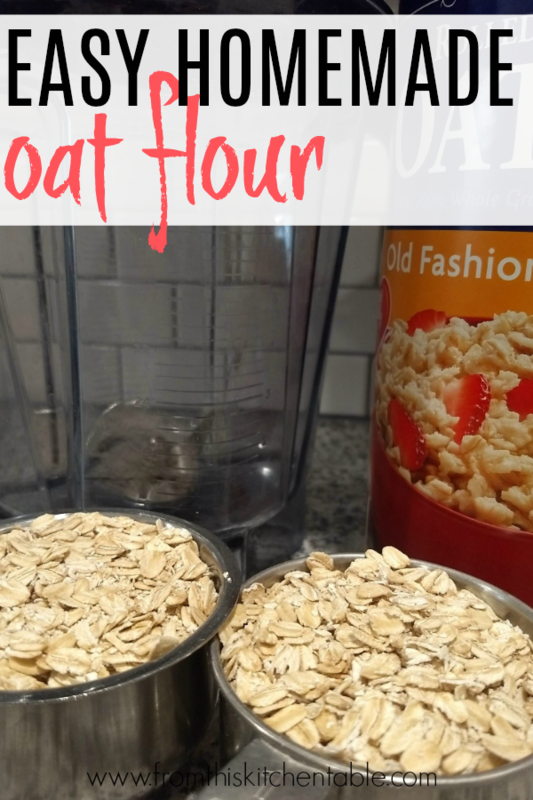 Refrigerate until serving (at least several hours or up to a day early). This entry was posted in Food, Recipes, Sides on November 14, 2018 by Deanna Michaels. I love spaghetti squash. 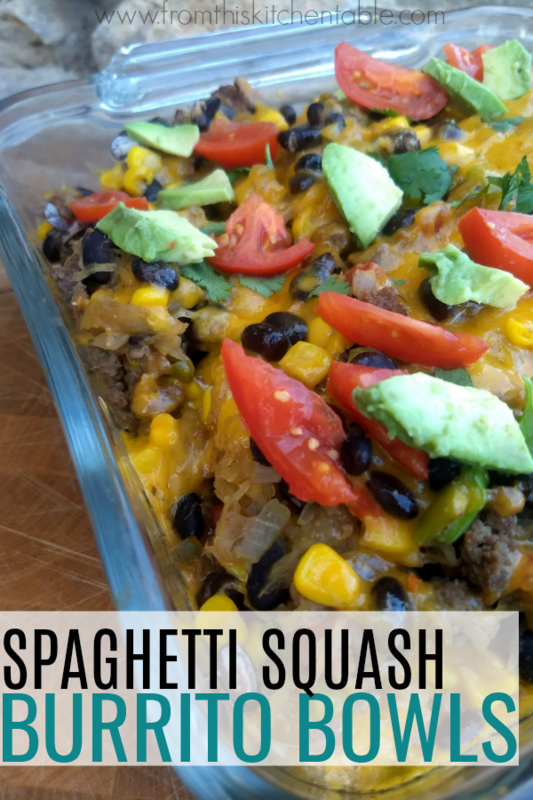 Several years ago I posted this recipe for Tex Mex Spaghetti Squash, a few weeks ago Spaghetti Squash Chow Mein, and today I have Spaghetti Squash Burrito Bowl recipe for you! 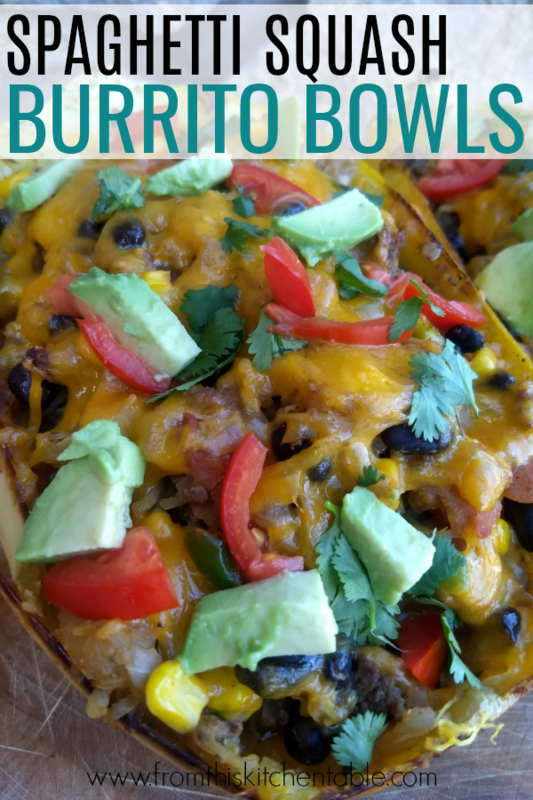 Mexican food (or technically Tex Mex) is a staple in our house, so I knew I had to do a twist on a burrito bowl with some of the squash I bought. 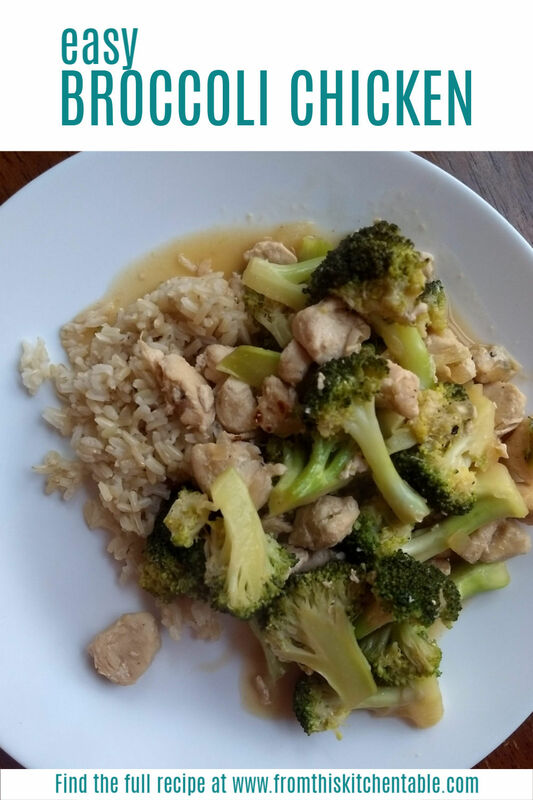 This recipe was a winner! The 2 1/2 year old had thirds. Thirds! “More spaghetti squash” she kept saying. 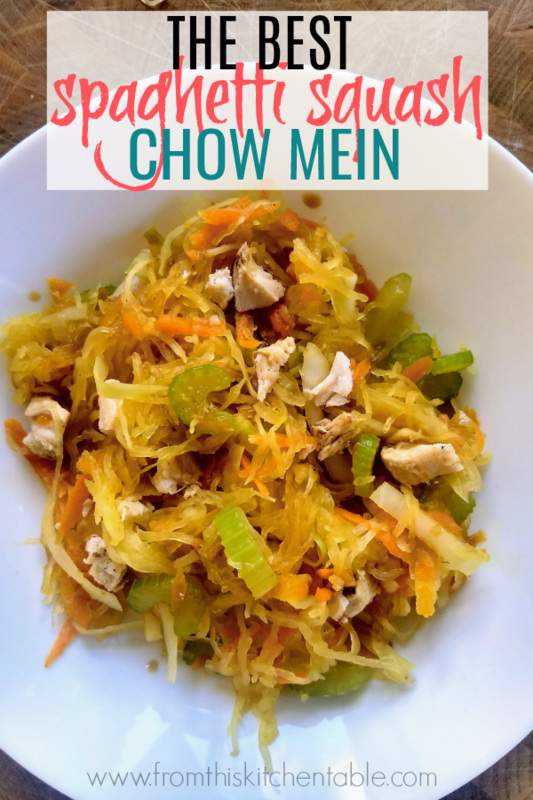 As with the Spaghetti Squash Chow Mein recipe, the flavors are such that even my (non squash loving) husband actually liked this recipe. As with most dinner recipes, this is so easy to tweak and adjust to your family’s preferences. Can’t stand bell peppers? Simply leave them out. No fancy ingredients. If you don’t have access to Rotel, substitute fire roasted tomatoes or even just diced tomatoes and add an extra jalapeno. Leave the cheese off if you are dairy free. This recipe is easily cut in half. The 8 pounds of spaghetti squash serves 8 (or my family of 5 two meals). Cut back to 4 pounds if you are only serving a couple of people. The meat amount is up to you and your taste preference as is the final spice amounts. My kids are fairly wimpy, so I have to watch the chili powder amounts. Be sure to read the recipe notes for an additional baking method. 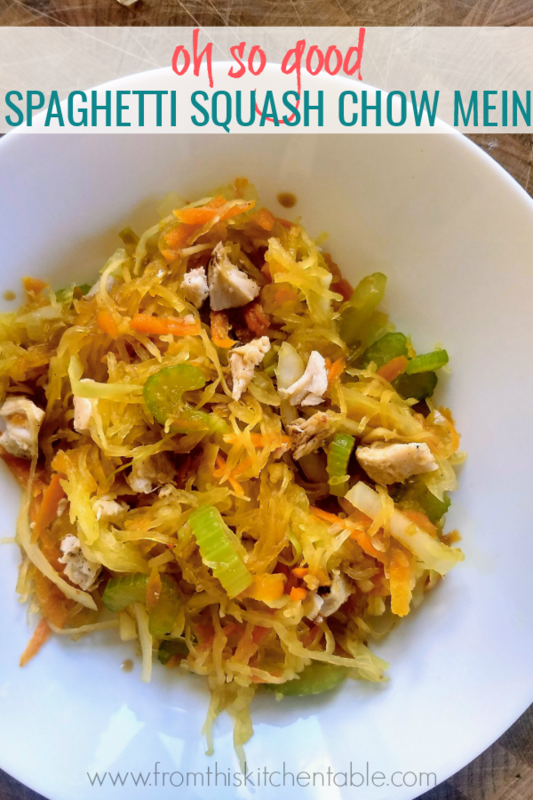 Cut spaghetti squash in half and scrape out the seeds and stringy insides. Drizzle lightly with olive oil and sprinkle with salt and pepper and a little cumin and chili powder. Place cut side down on a baking sheet and bake at 350 degrees for 45 minutes. Remove from oven and let cool until you can handle them. Use a fork to scrape across the squash short ways to make "noodles". In a large skillet, brown the beef. Add onion and jalapeno and saute a few minutes. Add garlic and saute a few more minutes. 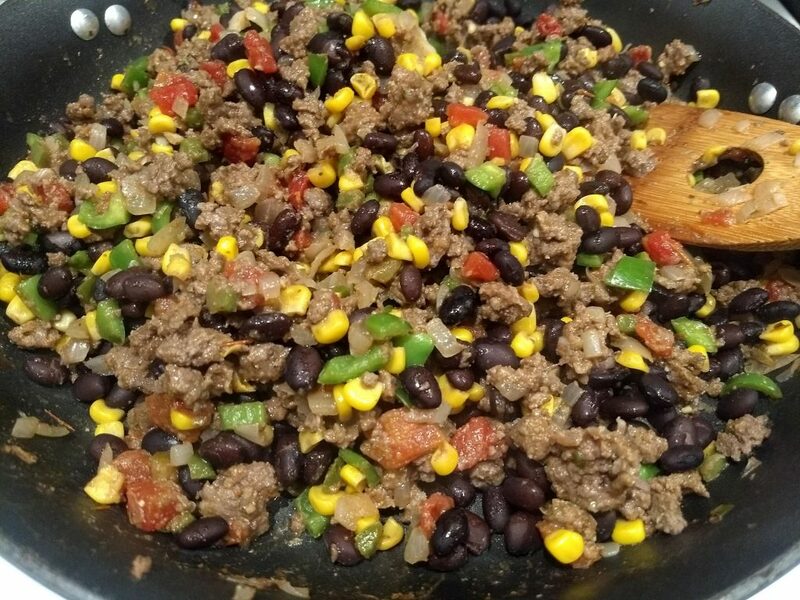 Add bell peppers, black beans, corn, tomatoes, 1 t. salt, 1 T. cumin, and 1 t. chili powder. Cook until everything is heated through and tender. 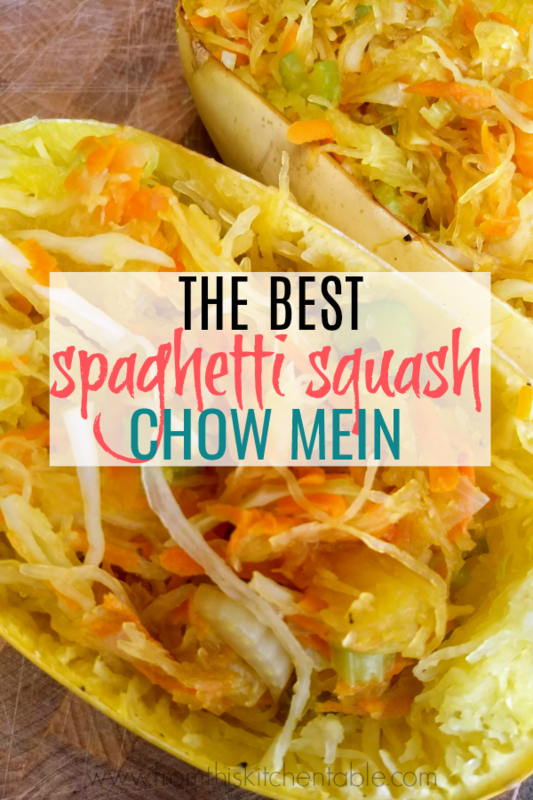 Add spaghetti squash to skillet and toss everything together. (See notes for second option) Adjust seasonings if needed. Return the spaghetti squash mixture to the shells or a 9x13 baking pan and top with cheese. Serve with any of the optional toppings. 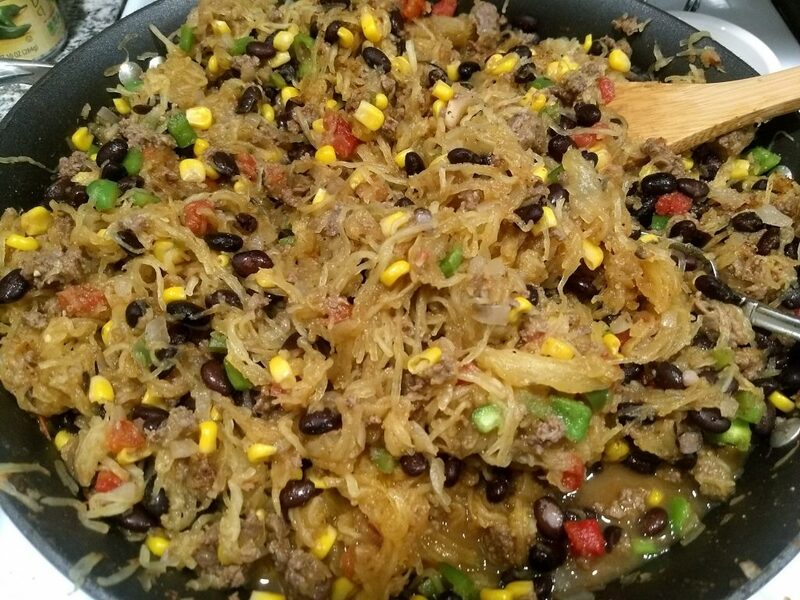 When you have the beef mixture finished and the spaghetti squash in noodles instead of combining it all together you can layer the spaghetti squash in the bottom of the shell (or pan) and spread the beef and veggie mixture on top of that and then top with the cheese. This entry was posted in Main Dish, Recipes on October 31, 2018 by Deanna Michaels. 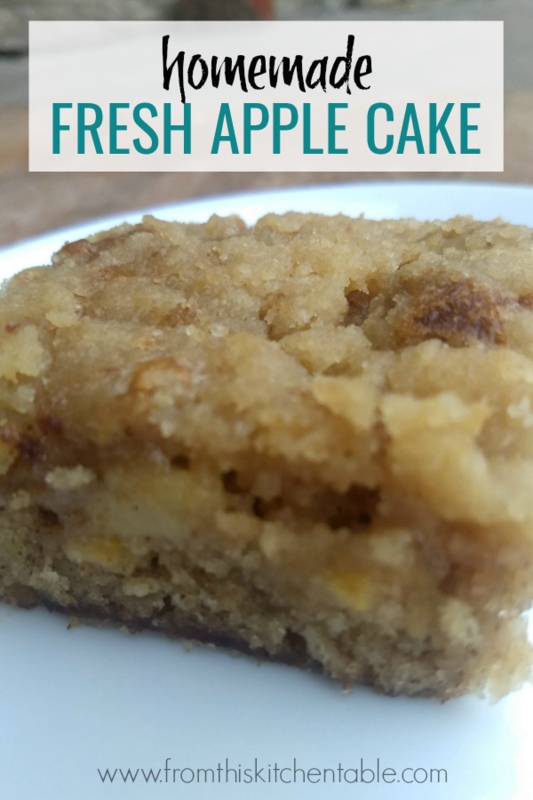 Fresh apple cake. Sounds like the perfect fall dessert. Or maybe year round dessert. Let’s talk apples for a minute. There are fresh apples and then there are apples fresh off of the tree. Oh my goodness, aren’t they amazing? A friends brought me two plastic sacks full of of apples from their trees last week. That meant a few things needed to happen. Making homemade applesauce, baking a fresh apple cake, and lots of eating them raw. My kids ate these up. They tasted so good. Then there is the crumble topping that puts this cake over the top. 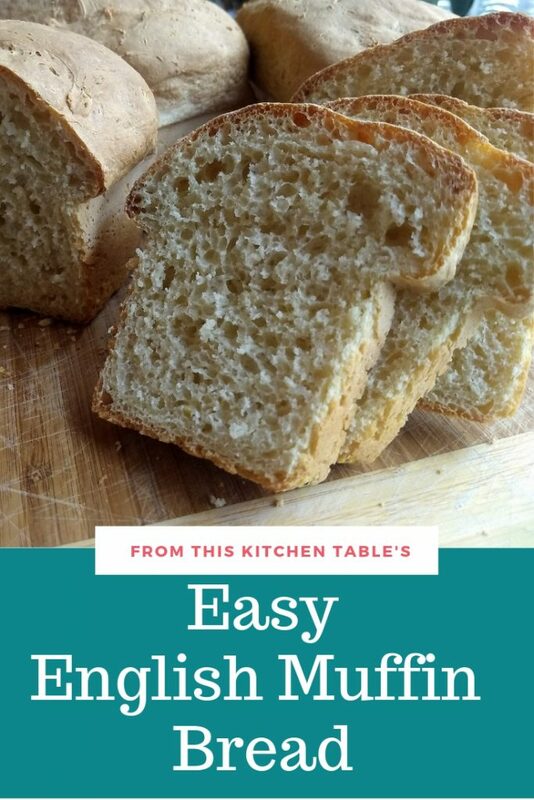 I also love that the recipe uses all basic ingredients that anyone typically has on hand. Then there are even easy swaps you can make within these basic ingredients. 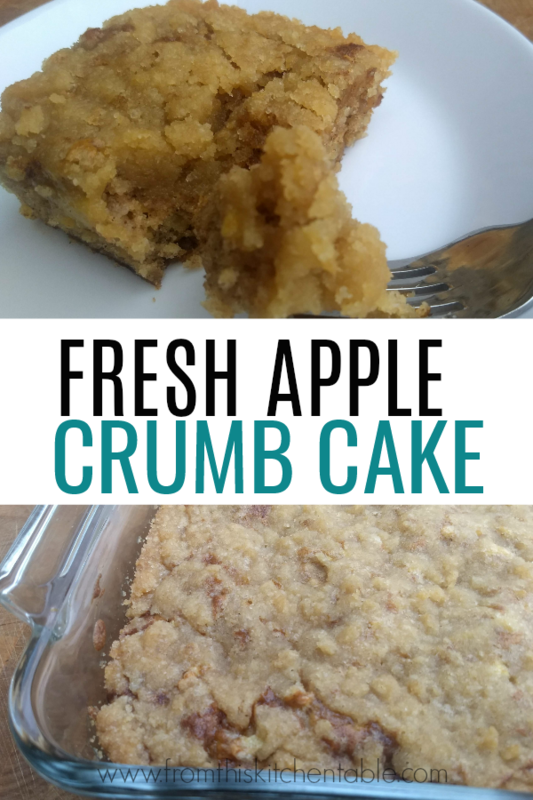 Fat: the recipe calls for butter but feel free to replace it with coconut oil (or other oil of your choice) in the cake and the crumb topping. 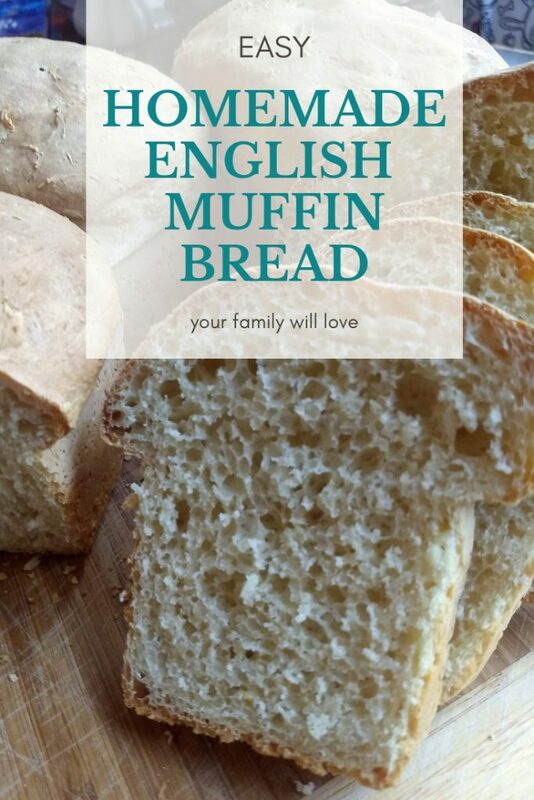 Flour: this recipe calls for white flour, but whole wheat flour would make the perfect substitute. Soft white wheat is my favorite for non yeast breads. Nuts: nuts are one of those personal preference things. Do what works best for your family. My crew prefers without. Half a recipe: this recipe is one where you can easily cut it in half. Bake in a square baking dish and decrease the baking time. Combine butter and sugar for the cake; add beaten eggs. Sift dry ingredients together and add alternately with the chopped apples and nuts to the butter mixture. Put into a greased 9x13 inch pan. Combine topping ingredients and sprinkle evenly over the cake batter. This entry was posted in Desserts, Recipes on October 24, 2018 by Deanna Michaels. 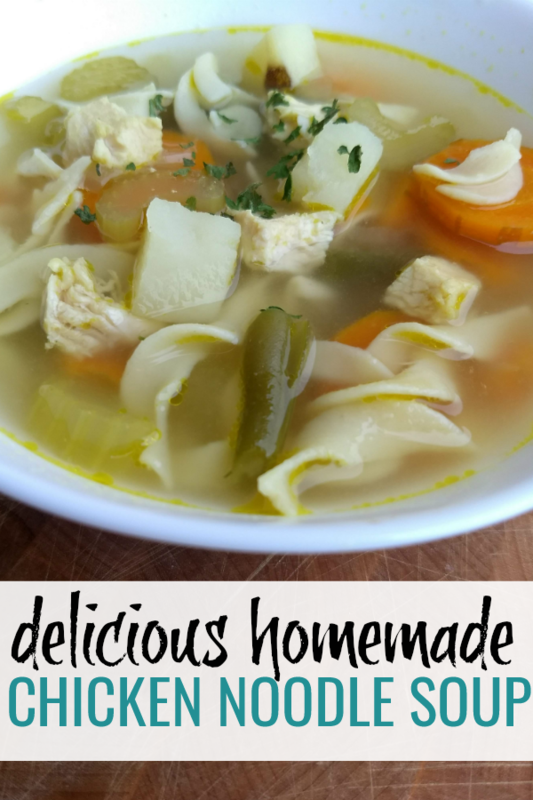 This chicken veggie noodle soup is a family favorite. Perfect for a fall or winter day. Actually, we’ve on occasion even made it in the summer. Affiliate links are used in my posts. See the disclosure page for more information. 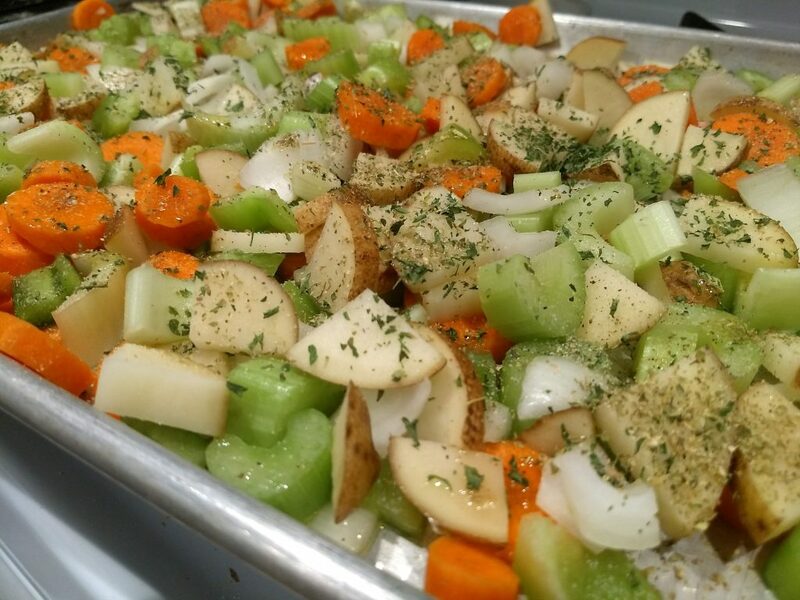 This soup is full of vegetables: carrots, onion, garlic, potatoes, celery, and green beans! This is also the perfect soup to make substitutes on. Don’t like green beans, simply leave them out or replace with corn or any other vegetable. Chicken veggie noodle soup is the perfect recipe to serve with homemade bread. It has made an appearance at our table several times for company as well. 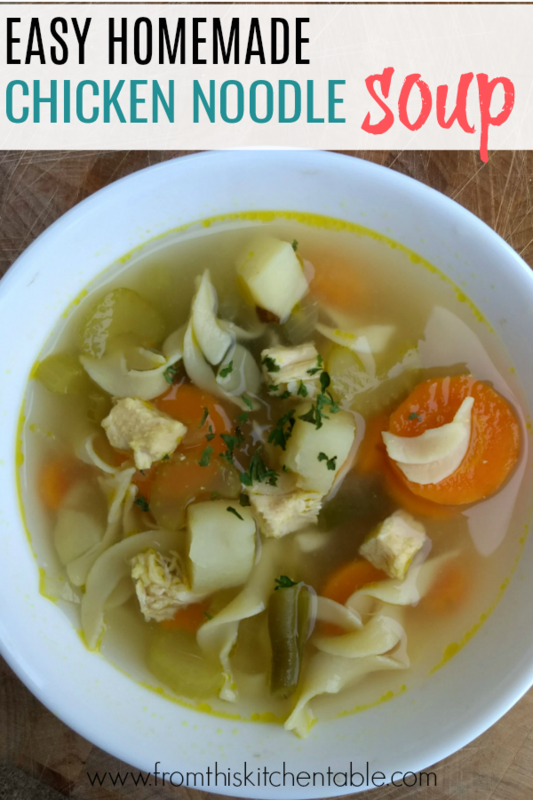 Bring out your stock pot and put chicken veggie noodle soup on the menu this week! In a large stockpot put stock, onions, garlic, and chicken. When chicken is cooked remove from pot and add remaining ingredients except for the noodles. Dice the cooked chicken (or pull meat from bones if using bone in chicken). When vegetables are tender add noodles and cooked chicken to the pot. Adjust salt and pepper to taste. Cook around another 10 minutes or until noodles are done. What are your favorite soup recipes? I have a few more I want to post for the winter months. 🙂 Soups are the best! 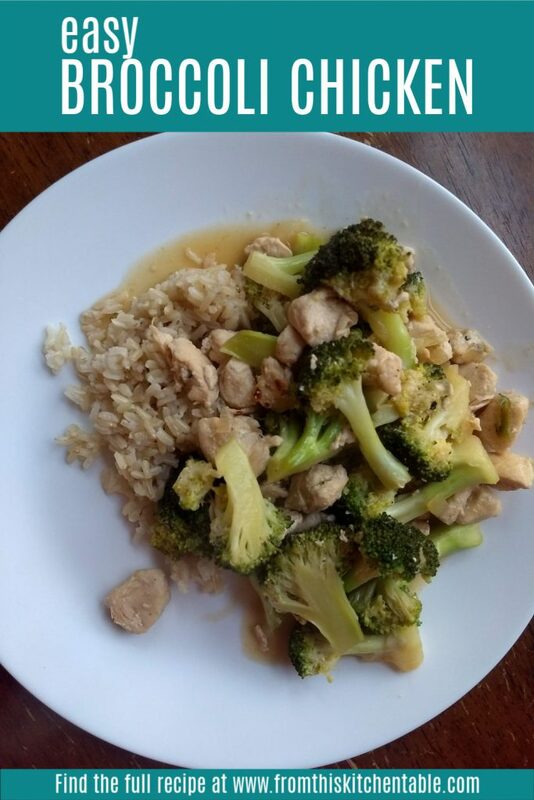 This entry was posted in Recipes on October 20, 2018 by Deanna Michaels.